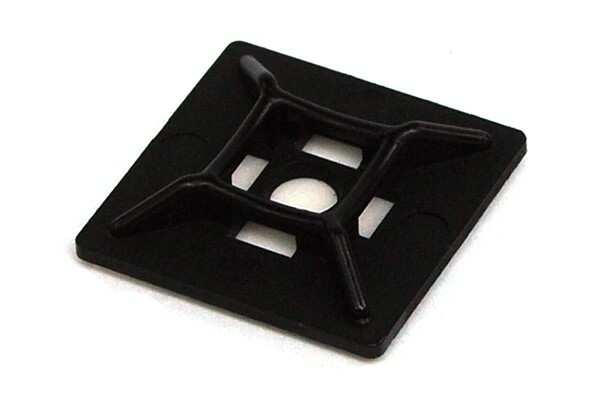 A clean case is now easy to achieve with the cable tie floor mount! Before this handy accessory was available rough tools had to be used to attach cables, hoses or wires to the case floor or sides. Holes had to be drilled into the new, expensive case. With this new mount all that is not necessary any more! Simply pull of the protection foli on the underside and stick onto the desired spot in the case. The latches on the top of the mount allow easy fixation of cable ties of any kind. The latches are also specially designed to keep zip ties in place by gripping their teeth to prevent voiding shifts of the cable bundle.